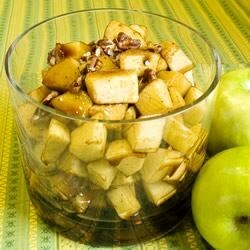 "This is a wonderful tangy, sweet, and delicious way to eat apples. I love it with apples, but my mom also does this with strawberries or pears. I've also done this with just one apple for myself when I wanted a quick snack. Pink lady and red delicious apples will also work well." In a large bowl, mix together the balsamic vinegar, brown sugar and black pepper. Taste and adjust sugar and vinegar to your personal preference. Add the apples, and stir to coat. Easy and delicious! I skipped the pepper, and made just enough for one serving. Makes a perfect snack!